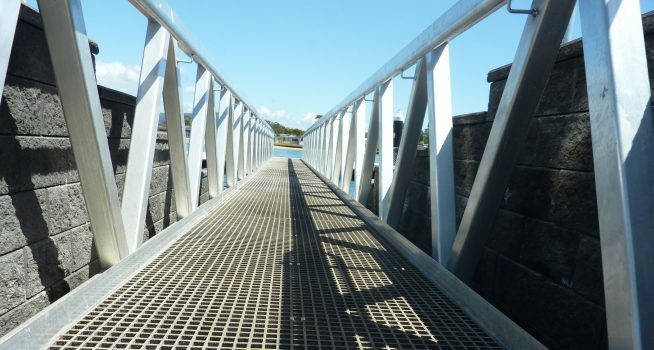 Made as a high strength, single piece construction frp mesh panel product, Treadwell's FRP grating is fabricated from glass fibres which are finely placed in a matrix. Cost effective and light in weight as some of their crucial benefits, they are the definitive modern day material. They are also strong and are composed of less brittle and heavily composed materials. The light weight nature of GratEX® panels allow for eﬀective on-site fabrication/trimming whilst ensuring that wastage is reduced. Unidirectional load bars allow for use without continuous side support and so contribute to cost eﬀectiveness. GratEX® oﬀers all the benefits available with grating made from other materials plus a host of advantages over traditional options. Because of its advantages and flexibility, FRP has become the optimal choice in a multitude of applications over a wide scope of industries. Treadwell offers a range of standard panels to our clients. We are also able to customise panels based on drawings by clients or our in-house design team can provide professionally drafted ones. We serve to bring to you the best quality FRP gratings that will maximise benefits for any application.